Constance Belle Mare Plage oteline istediğiniz tarihleri içeren bir müsaitlik talebi gönderin. Distributed on 3 levels (Ground Floor, First Floor and Second Floor), the sea facing prestige rooms are located in the south wing of the resort. Each room has access to a private balcony and some directly overlook the swimming pool. The area provides enough comfortable space to accommodate a maximum of 3 persons. Interconnecting prestige rooms are available for families. The spacious bathroom with fabulous bath and walk-in shower adds an extra dash of luxury, while some of the rooms come with a view across the swimming pool. Each room has a private balcony. Facing the Indian Ocean, spacious Junior Suites offer large and fully furnished balcony/terrace perfect for sunbathing. These luxurious suites feature huge beds and fabulous contemporary bathrooms with large bath and walk-in shower. Perfect for couples. Interconnecting suites also available and are ideal for families. Two of the Junior Suites are for disabled guests. The Junior suites on higher level are accessible via stairs only. 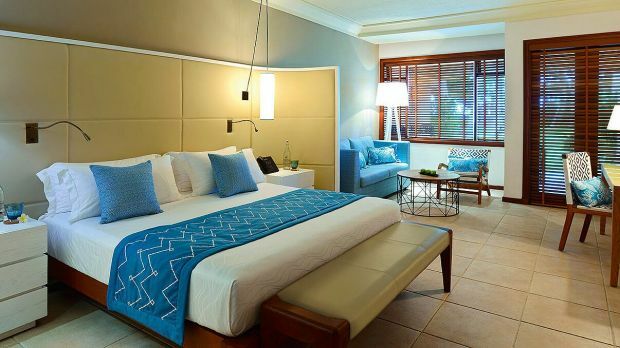 All Beachfront Junior Suites offer a large and fully furnished balcony/terrace, including a sofa bed and dining area. The contemporary bathroom with large bath and walk-in shower beckons for long soaks. Perfect for couples. Interconnecting suites also available and are ideal for families. Two of the Junior Suites are for disabled guests. The Junior suites on higher levels are accessible via stairs only. Ocean view deluxe suite located in south wing of resort. Separate living room and optional feature of being connected to a prestige room which is suitable for families. 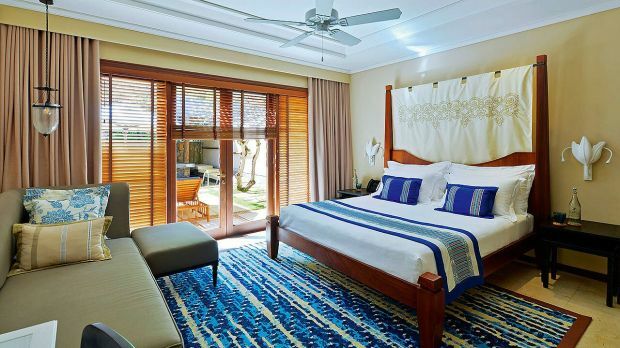 The villas at Constance Belle Mare Plage are the embodiment of a new art of living. This double storey villa features a garden view, two air-conditioned bedrooms (one on ground floor, one on first floor), an en-suite bathroom with separate shower/bath/WC and double vanities, outside open air bath/shower, living/dining room with satellite TV/DVD/CD player, Wii, WIFI, guests toilet, kitchenette exclusively for service, minibar, terrace with private heated pool and a pavilion overlooking the pool. Upon request, the personal Villa-Master can arrange for in-house breakfast, lunch, dinner, BBQ and other needs. Separate check-in facilities and baby friendly facilities are included. The villa is comprehensively equipped with quality amenities for babies and children such as cots, bathtubs and walkies-talkies. Double story beachfront villa features 2 air-conditioned bedrooms (one on ground floor, one on first floor), en-suite bathroom with separate shower/bath/WC and double vanities, outside open air bath/shower, living/dining room with satellite TV/DVD/CD player, Wii, WIFI, guests toilet, kitchenette exclusively for service, minibar, terrace with private heated pool and pavilion overlooking the pool. Personalized Villa Master service; upon request, the Villa-Master can arrange for in-house breakfast, lunch, dinner, BBQ and other needs. Separate check-in facilities and baby friendly facilities. Villas are comprehensively equipped with quality amenities for babies and children such as cots, bathtubs and walkies-talkies. Double storey villa features a garden view, three air-conditioned bedrooms (one on ground floor, two on first floor), en-suite bathroom with separate shower/bath/WC and double vanities, outside open air bath/shower, living/dining room with satellite TV/DVD/CD player, Wii, WIFI, guests toilet, kitchenette exclusively for service, minibar, terrace with private heated pool and a pavilion overlooking the pool. Upon request, a personal Villa-Master can arrange for in-house breakfast, lunch, dinner, BBQ and other needs. Separate check-in facilities and baby friendly facilities are included. The villa is comprehensively equipped with quality amenities for babies and children such as cots, bathtubs and walkies-talkies.